Next PostHuge line at the Samsung store this morning! Beautiful pic! Reminds me of the children’s song, which sounds scary for little kids to listen to, if you really think about it!!! That’s a great picture of the bridge. It looks beautiful at night. I only saw it during the day during my trip to London in August. The London Eye also photographs well at night. only one place for me where i want to visit again! Gorgeous! I drove across that bridge last year. Oh, how I miss London!!! I miss London – fantastic picture. Even though this pic was taken at night, the environment looks very clean!!!! It looks like it was very elaborately constructed. THANK YOU for the visit…..
Nice view ! London bridge is always looking gorgeous when it’s clear. That’s an amazing shot! Nice work! Ah good ol London Town.. Awesome pic! Reblogged this on Talent Hunting. 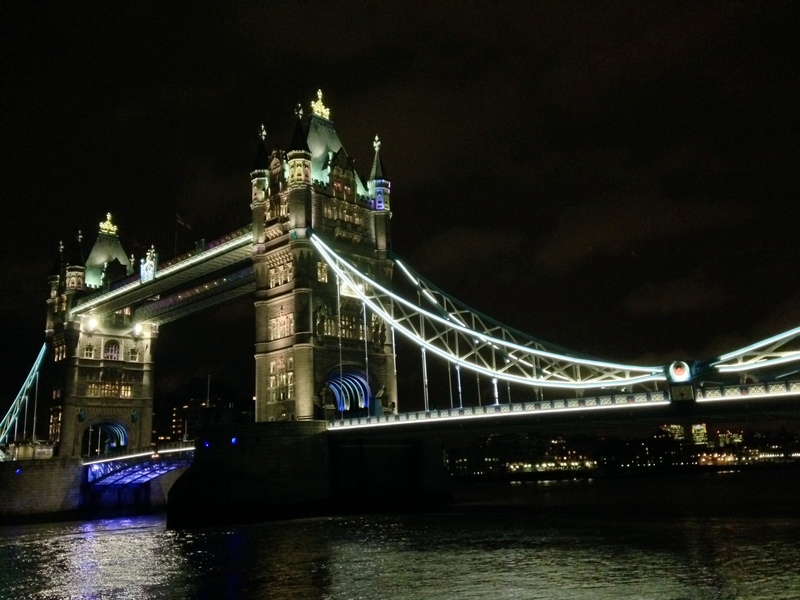 [ Smiles ] The London Tower Bridge is beautiful and the view is breathtaking! The water shimmers with the lights from the bridge, & just a few minutes ago, for the 1st time I noticed the buildings in the background look beautiful also! The river/lake looks very calm & peaceful. (Is this the Thames River)? Is it going on for fall over in England the way it is here? Unique blue under the bridge ! Reblogged this on sjtravelsite's Blog. Great shot of one of my favourite places! Reblogged this on Nick Bradbury. The blue lights are really beautiful!!! Does anyone know how long ago this was built? They must’ve been really talented people!!! I was there too and it was as beautiful as it could be. It kind of looks like castles (each side). One of the many sights of London that is an icon the world over. Awesome shot. So tempting to run there! I’m not sure, but I don’t think there are any bridges located anywhere else in the world that are as beautiful & intricately-constructed as this 1-whoever built this I’m certain must have put a great deal of consideration into how it was going to look/how majestic it was going to look after they were finished accomplishing their task!!!! Must have taken a really long time, & the individuals must have been very creative & intelligent. How lovely it is!!!! Gorgeous river & lights from the buildings surrounding it. The water looks very calm & placid. Gorgeous pic, lights make the building enchanting. What a great pic. I have been participating in a photo challenge on my Agent 54 Blog. I think I took some cool shots with my Kodak Easy/Share Z760. Check it out. I also write funny stuff. Looks kind of like a fortress. Stunning photo Matt, makes me proud to be English (I was born and brought up in London, though I’m now living in Essex). For your followers who have not seen this bridge before, there are 2 sections (bascules) that open to let ships go through. I only know what they are called because I did a bit of research lol – you learn something new every day 🙂 I was once lucky enough to see this happen while I was visiting the Tower of London, which is right next to the bridge. Awesome! Reblogged this on tea biscuit blog.